Elliott wins his 3rd Jamaican Title! FM Warren Elliott held off challengers to win his 3rd national title this past weekend in the 2004 Jamaican National Championship. The top six players of the event will qualify for positions on the Jamaican Olympiad team. Elliott led the field with 8-1 while NM Russel Porter scored 7-2 and 7-time national champion Shane Matthews scored 6-3. Joining the Olympiad team will be NM Duane Rowe (5-4) and NM Robert Wheeler (4½-4½). A strange occurrence took place in the last round when both Duane Rowe and Daren Wisdom came more than an hour late effectively forfeiting to Mark Holness and Bertram Scott. This result created a three-way tie for 6th place after which the officials decided that a tiebreak will be played to determine the 6th and final spot on the Olympiad team. The title is the 3rd for Elliott and he will lead the Jamaican team to Mallorca, Spain for the biennial Olympiad tournament. 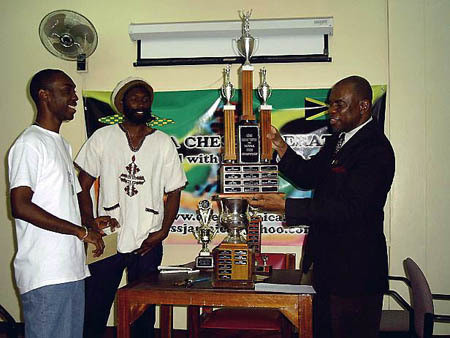 Jamaican President Ian Wilkinson (right) prepares to present FM Warren Elliott (left) with the Championship trophy while Negash Bezaleel (visiting from the US) looks on.